Although I don’t share a lot of my workout regiment with you guys. Working out and taking care of my body is a major component of my hectic lifestyle as a mom and fashion blogger. I work out 3 to 5 days every week. I have been doing this literally for the last 18 years of my life, and I have no intention of stopping. As a self proclaim fashionista (kidding), looking good doesn’t end with my daily style. Looking fashionable when I workout is a must. 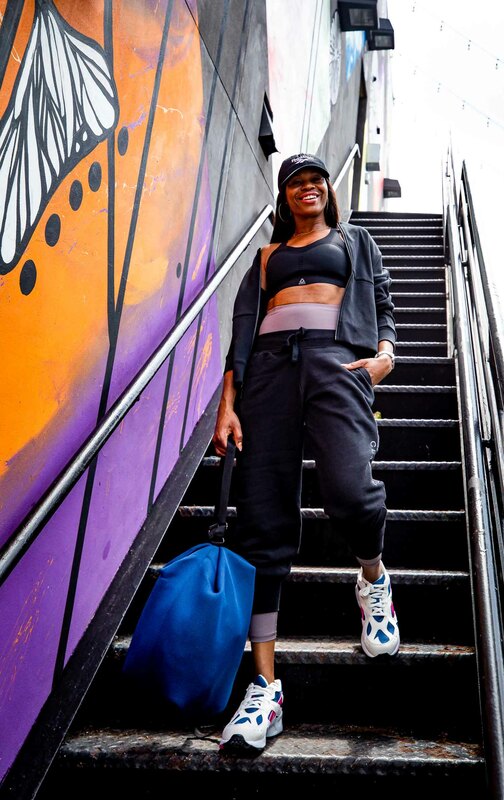 That is why I partnered with Reebok to try their stylish new sports bra the Puremove SportsbBra. I love this sleek and stylish sports bra for a number of reasons. The bra reacts to movement and affords me the support and comfort I need when I workout. It also offers flexible support which means it moves with me and doesn’t restrict me when I exercise or when I am chasing my kids. 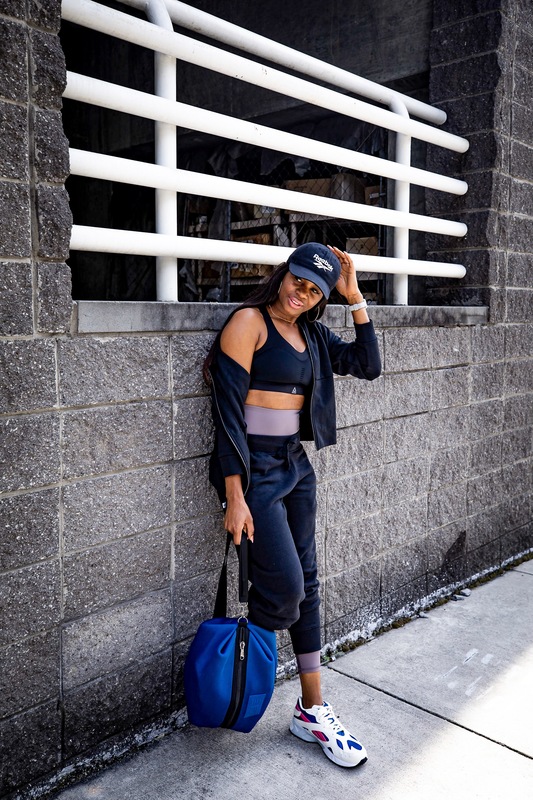 Another great feature of this bra is that it’s made for every body type, so all women can wear it.To complement this fabulous sports bra, I paired it with a few cool pieces from Reebok. Reebok has a host of stylish athletic gear for every day life. I layered a pair of high waisted leggings with their logo joggers to create a cool stylish layering look. The full zip sweatshirt cover-up, is comfortable, and stylish. I love the clean lines of this sweatshirt. 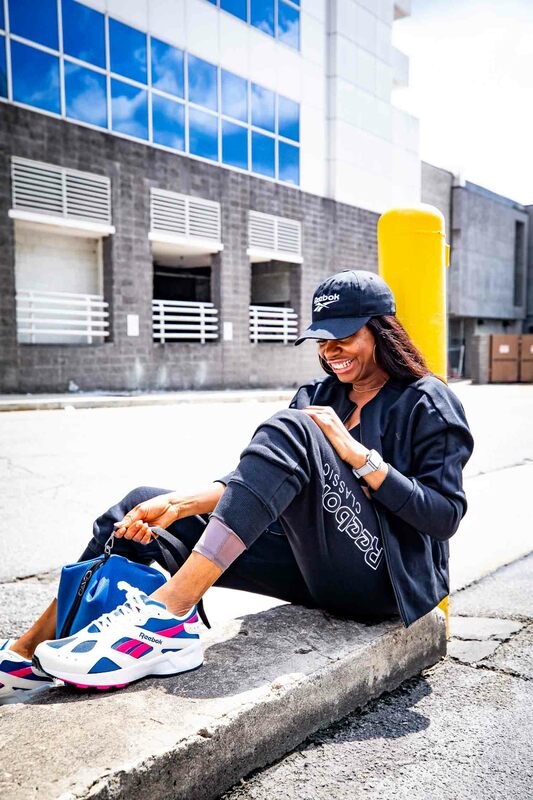 It’s chic silhouette allows this piece to transition from workout gear to streetwear seamlessly. My stylish lightweight backpack is perfect for the gym, and running errands. I used the blue color of the backpack to match my sneakers to the look. This classic Reebok logo baseball cap completes the look, making this a stylish and effective workout outfit.